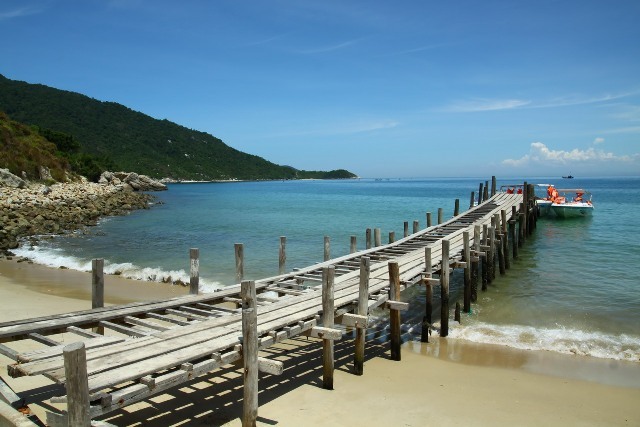 Hoi An Eco tour with Cham Island with 7 small islands, nowadays Cu Lao Cham are the good places with fresh environment. Speed boat to Cham Island “Cu Lao Cham” is a large island consists of server small islands distance 25 nautical miles off the coast from Hoi An. At the summer, if guests reaches for the island by normal boat, it takes 2 and half hour. But only 30 munites by speed boat. Cham island has total 7 islands including Hon Lao, Hon La, Hon Kho me, Hon Kho at the area of 16 sq.meter, whereby the largest island is Lao. Lao island is circle shape at the high of 500m, the forest here is natural, a lot of woods and rare animals. There are nice beaches at Bim and Ong beach. The island is a place where shelter for value swallow birds. Around the island has alots of color corals under the water, about 3.000 residents living focusing at Lang and Huong beaches as fishing and agriculture. A small part of people living at the village works at service and handicraft. The tour takes half day to Lang beach for seeing some interest places as such Au Thuyen a shelter for boats at bad weather, an over-100 years Hai Tang pagoda remarks the Buddhism came here for long time ago, Ong temple a place worships a big fish buried here. √ Personal expenses such as: shopping, telephone, beverage, etc. √ Children from 5 – 9 years old: 75% of the fare. √ Children over 10 years old charged as an adult.